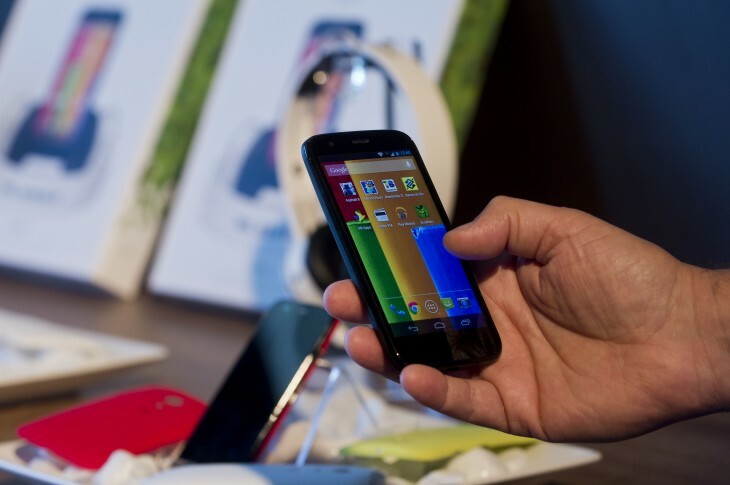 If you just unwrapped a new Android smartphone or tablet for Christmas, listen up. While there are no shortage of apps waiting for you in the Google Play store, only a handful of them are worth downloading on your new device. So rather than digging through user reviews or picking out apps on a whim, read our guide to find out which Android apps are worth your time and money. It’s easy to forget that mobile phones, above all else, are designed to help us communicate with other people. 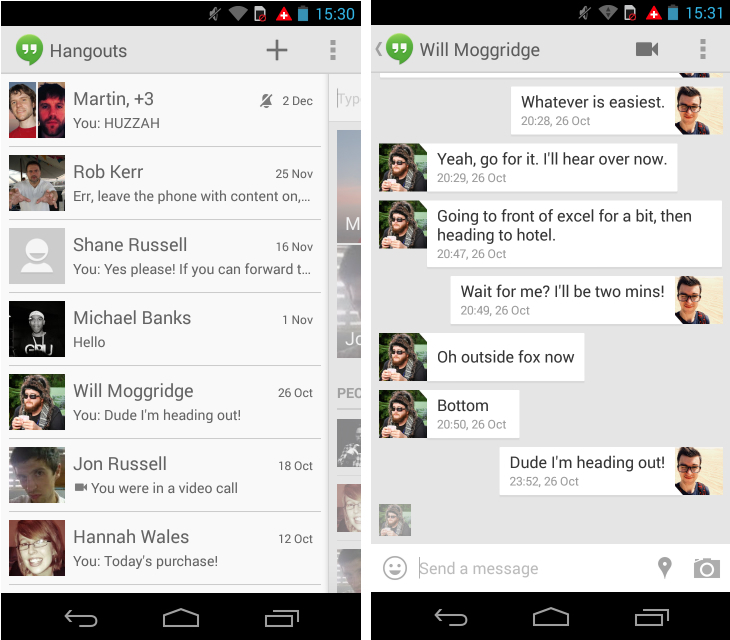 To that end, it’s important that you stock your new Android device with some of the best mobile messaging apps around. 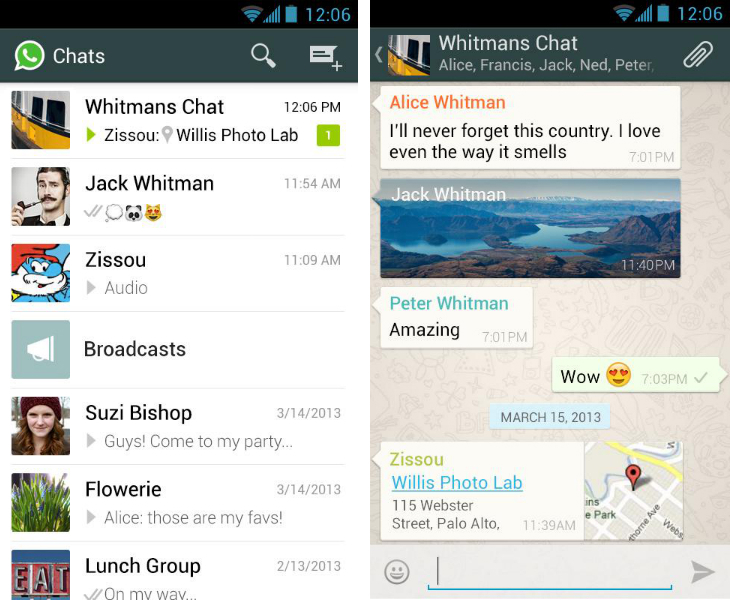 WhatsApp is one of the most popular messaging apps in the world, with over 400 million monthly active users. Chances are that someone you know is using the cross-platform service, so it’s definitely worth checking out. It’s a reliable, well-designed and straightforward app. The service uses your current internet connection to send and receive text messages, as well as photographs, videos and your current location. Conversations are laid out with messages flanking the left and right-hand side of the screen too, making it easy to keep up with multiple participants. The only catch? WhatsApp currently uses a subscription model. You’ll get the first 12 months for free, but it’s $0.99 thereafter. Given it’s feature set though, that’s not a bad deal. Google’s cross-platform messaging service is still in its infancy (it was only announced at the company’s 2013 I/O conference) but it’s already evolved into a formidable app on Android. Most smartphones come with the client pre-installed, but if it’s missing from your device for any reason, you can download it for free from the Google Play store. If you’re running Android 4.0 or higher, you’ll find that the app now supports SMS messages, effectively replacing the default Messaging app that Google used to ship with its operating system. It’s a clean, intuitive app with some neat tricks up its sleeve: transparent profile pictures show how far each recipient has read up to, 850 hand-drawn emoji and video calls with up to 10 other people. I rarely use Snapchat – maybe that’s because of my age – but it’s easy to see why this cheerful photo and video sharing service is one of the most popular and talked about messaging apps on Android. 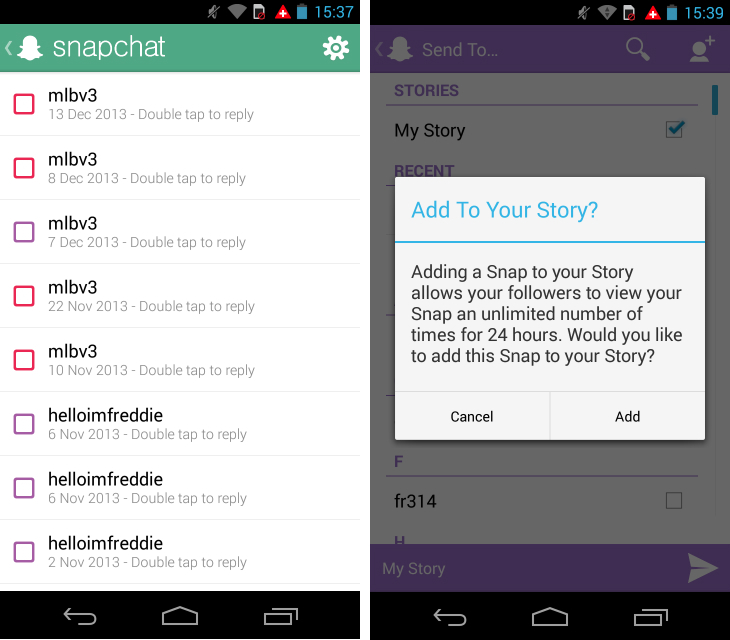 The premise is simple – users record a Snap and then send it privately to a small group of friends. The kicker is that each message can only be viewed for up to 10 seconds before it vanishes. The app allows you to share moments that you don’t want preserved forever on the Web. Snaps can be silly, sensitive or just plain weird – it doesn’t really matter, because before long the content will have vanished from your recipient’s device anyway. Yes, Snapchat is home to a fair amount of sexting, but it can be used to share fun, harmless content too. If you’re a regular Facebook user, or have many friends and relatives who are invested in the behemoth social network, Messenger is an invaluable app to have on your new Android smartphone or tablet. This is a clean, well-designed messaging app syncs not only with its iOS app counterpart, but also Facebook chat on the Web. So if you know a lot of people who always keep Facebook open in a tab at home or work, it’s worth pinging them a note with Messenger; unlike other mobile-only services, you’re far more likely to get a speedy response. 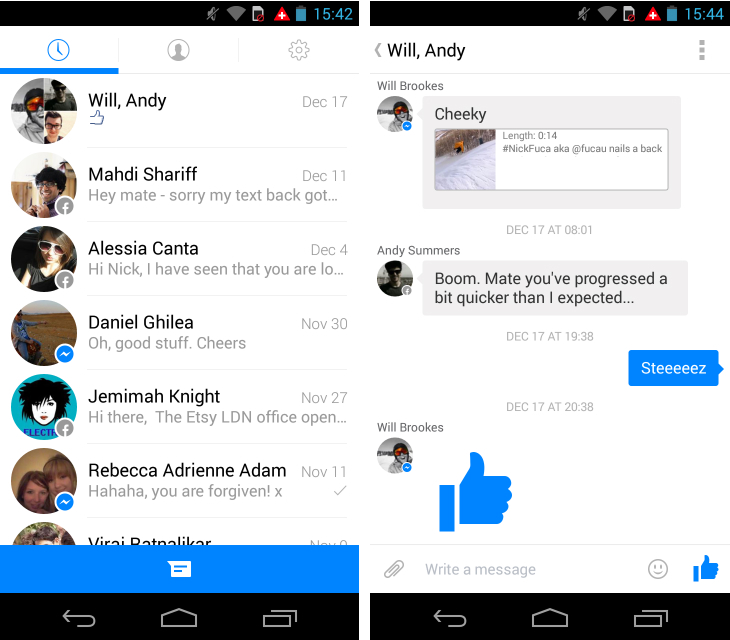 Messenger also offers an ingenious multi-tasking feature called Chat Heads. It lets you separate the conversation into an isolated window, which is easily minimized by tapping on the recipient’s circular icon. This allows you to keep the discussion nearby while you continue to use your smartphone or tablet. Wave goodbye to constant back-and-forth app switching. 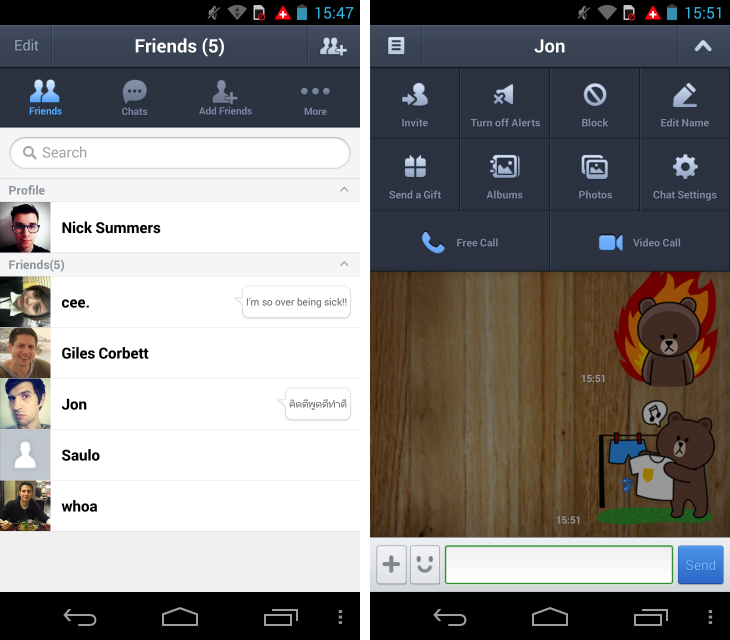 If quirky stickers and customization are important to you, it’s hard to go wrong with an app like LINE. You can change the wallpaper to anything saved on your device, make video and audio-only calls, share photo albums and use a huge variety of in-app stickers. The feature set is simply astounding. LINE even offers a series of connected video games for your smartphone, and the option to follow official accounts from celebrities such as Katy Perry and Rafa Nadal. Some sticker packs cost money, but otherwise the Android app is completely free. If you can get your friends on-board, this is one of the most reliable, fun and powerful messaging apps we’ve ever come across. If you haven’t done so already, it’s time to ditch your ageing point-and-shoot digital camera. Some smartphones and tablets are better than others in the camera department, but the sheer range of apps on offer for shooting, editing and sharing makes any Android device a powerful and versatile little shooter. 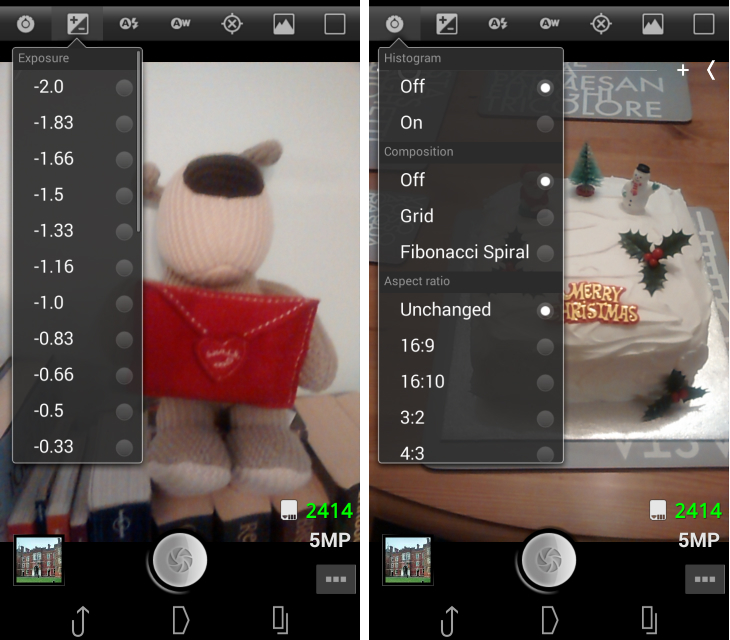 Most Android devices come with a basic camera app aimed at beginners who just want to shoot. But if you’re struggling to capture great photos, you’ll probably need a more fully-featured app ready on your smartphone or tablet. For our money, ProCapture is the best shooting app around. It all comes down to the interface. The app places all of the key tools and settings that you might need on the left-hand edge of the screen, where you can easily grab them with your thumb. All of the tools are only one-level deep too, so you won’t need to spend any time digging through sub-menus. The app offers incremental exposure compensation, different image resolutions, white balance and focusing modes, and far more. If you’re passionate about photography, this is a no-brainer. 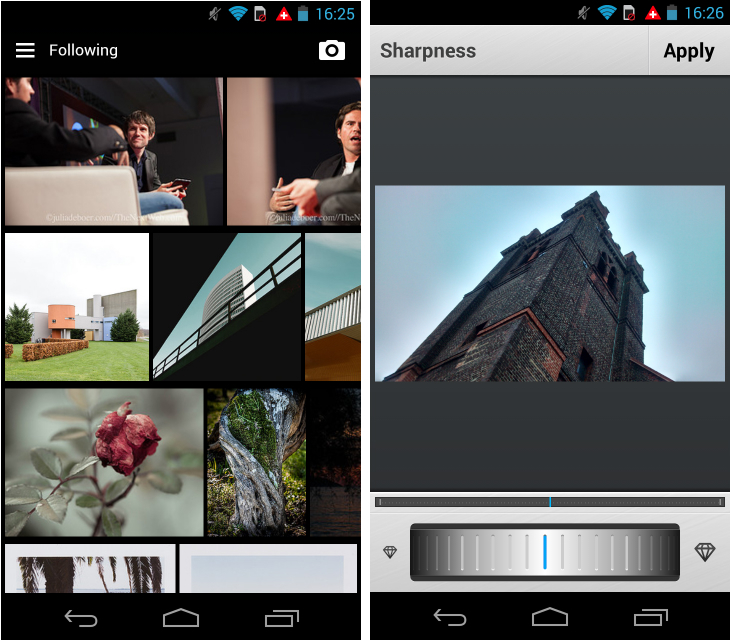 Snapseed, now owned by Google, offers arguably the best photo-editing app on Android. It offers a highly intuitive control scheme for tweaking photos; just swipe up or down anywhere on the screen to select new tools, then slide left or right to alter its intensity. You’ll need a few minutes to grow accustomed to this touch-friendly UI, but as soon as it ‘clicks’ you’ll never look back. Snapseed lets you adjust the brightness, ambiance, contrast and saturation of your photos, in addition to filters, ‘bokeh’ effects and frames. It’s easy to compare your adjustments with the original version using the switcher in the top right-hand corner of the screen, and there’s also a set of tools to help you straighten, crop and sharpen your favorite snaps. Instagram boasts over 150 million monthly active users, making it one of the most interesting and creative photo-sharing communities around. Even if you hate the app’s analog-inspired filters, it’s a fantastic place to share square-crop photos with the wider world. The Android app supports short videos up to 15 seconds in length, as well as private messaging through a new feature called Instagram Direct. It’s dead simple to use and if you have any friends or family that use the service, it’s the perfect way to share and discuss heart-warming moments. Need some new filters? 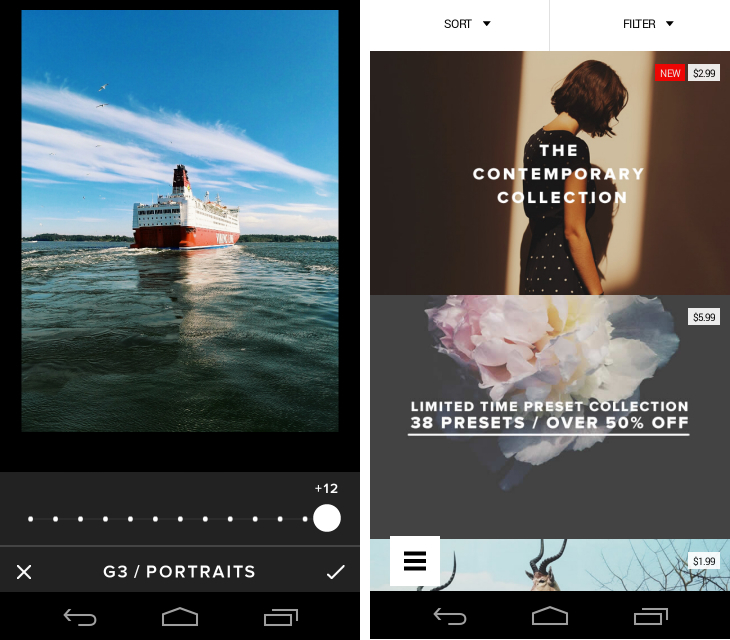 VSCO Cam has got you covered. The Android app offers a lovely range of subtle, professional tints that will make even the most uninspired photos look like they were captured with a high-end DSLR camera. The intensity of each filter can be adjusted with a simple slider and there’s also some basic editing tools for adjusting the exposure, temperature, contrast and grain. It’s a slick app to use and if you’re still not satisfied, VSCO Cam has an in-app store with even more creative filter packs to choose from. For many photographers, Flickr is still the only photo storage and sharing platform worth talking about. Since Marissa Mayer took over at Yahoo, the service has been given a new lease of life with a fresh look and one terabyte of free space. 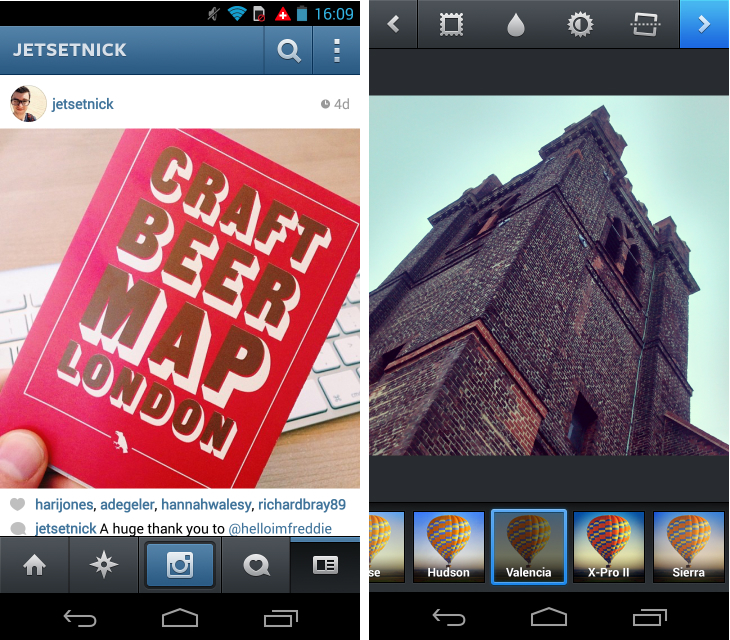 The Android app is the perfect companion, with a beautiful grid filled with photos uploaded by the other Flickr users that you’re following. A slide-out menu gives you access to your profile page, groups, notifications and search, as well as a handy Explore section for discovering new awe-inspiring images. You can also shoot and upload your own images, taking advantage of Aviary‘s photo-editing tools to give it a good polish beforehand. 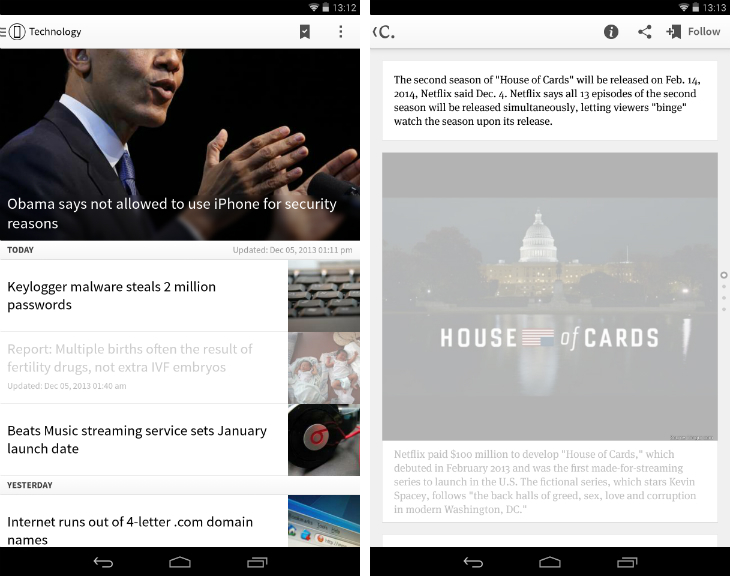 Press is a sublime news reader app built exclusively for Android. It supports a number of third-party RSS services including Feedly, Feedbin and Feed Wrangler; once you’ve signed in with an existing account, all of your lists and feeds will be imported and synced automatically. The app is split into a few different levels, visible as vertical columns. You start with a complete set of lists on the left-hand side, with an array of thumbnails for all of the contained feeds on the right. By tapping on any of these icons – there’s also one to review all of your subscriptions collectively – you’ll move down to the next level, which gives you access to individual stories. Select the article of your choice and Press will display it in a clean, orderly fashion. If all of that sounds a little confusing, fear not. In use, this approach is fast and intuitive, with clear signposts so that you always know where you are within the app. It’s an attractive, unique design that feels both light and fully featured. More than worth the price of admission, in our eyes. Since Google Reader went into retirement, Feedly has become the RSS reader of choice for many news junkies. It’s beautiful to look at and incredibly responsive, with a fleet of powerful apps on iOS, Android and the Web. At its core is a plethora of different viewing options, which will appeal to different users based on their mood and consumption habits. The title only view is perfect for power users, packing in as much information as possible, while the magazine view caters to a slower, more laid-back reading experience. The navigation menu, swipeable from the left-hand edge of the screen, shows all of your lists and the feeds that are contained within them. It’s fast and well-designed, with a simple process for adding new feeds and an engaging Discover section for finding new content from outlets outside of your lists. Flipboard has a simple mission: To digitize the often stunning design and layouts found in print magazines and newspapers, as well as the experience of stumbling across new, engaging articles in one of your favorite publications. The Android app is a joyous experience across both smartphones and tablets, offering a visual and straight-forward means of building your own personalized magazines. You can select your general interests and then immediately dive into a pre-generated set of articles, laid out in the style of a newspaper. Power users can also create their own magazines by tapping the plus button next to each item, followed by a name and a description for their new digital reading list. The joy of Flipboard is arguably in its reading experience though: Each article is served up with a minimalist interface and an elegant flip animation, as if you were turning the page of a good book. Circa is a fresh breed of newsreader app that offers brief, bite-sized news stories tailored specifically for mobile consumption. Rather than simply regurgitating what’s already available on the Web, its in-house team of editors produce new stories with distinct and easily digestible sentences, quotes, photos and links. The app itself is split into various sections including top stories, politics, technology, science and health, with a clear stream of stories based on when they were published or last updated. Each article begins with a near-full screen photo and is then followed by series of story modules that move in and out of focus as you scroll down the page. Circa won’t appeal to everyone. 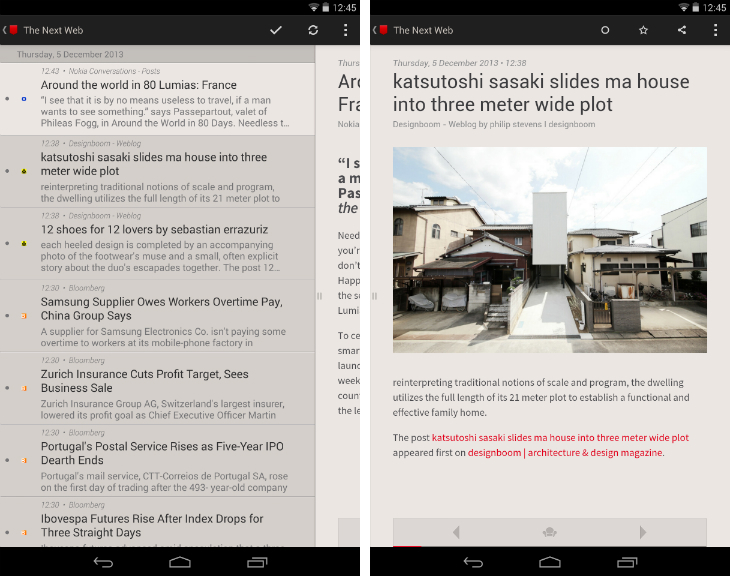 This isn’t an RSS reader, so you’re tied to the stories that the app’s editors choose to cover day-in, day-out. Nevertheless, it’s a unique experience that’s been fine-tuned specifically for your smartphone or tablet. If you want a quick overview of today’s headlines, this is your go-to app. It’s a common occurrence: You’ll find an interesting article on the Web, but you just don’t have the time to read it there and then. You might try to remember the headline or bookmark it for later, but when you do have some free time for reading, it’s lost or completely forgotten. Pocket is a sublime ‘save-it-for-later’ app which lets you archive interesting content from the Web and then quickly find it again from almost any device. Even if you’re without an internet connection, the app will know to download your articles for offline access; perfect when you’re about to board a plane, train or tube. 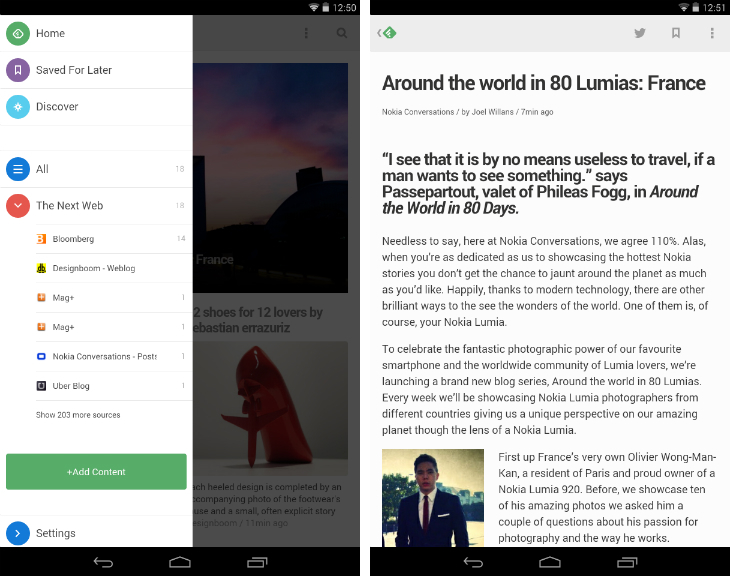 The app displays each article using a stripped back, minimalist layout available in a light or dark theme. The latest update (version 5.0) added highlights – the best and most relevant content you’ve saved – and quick suggestions, denoted with a new ‘Best Of’ tag. Any Android smartphone or tablet can also double-up as a pocket-sized music jukebox, effectively replacing any portable MP3 player that you might have lying around the house. 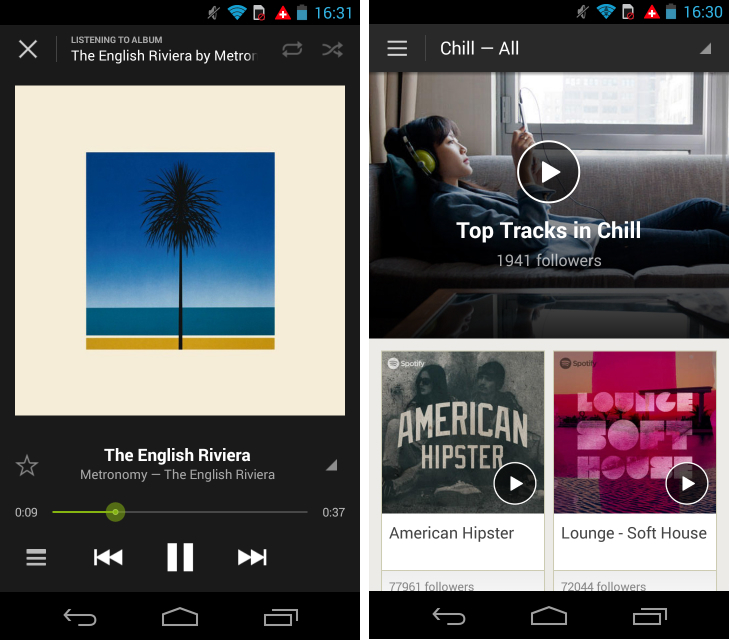 There are a wide selection of apps for streaming music on the move, but there are some of our favorites. If you’re going to have a conversation about on-demand music streaming services, it’s almost impossible not to talk about Spotify. The company lets you stream any album, artist or playlist for free in shuffle mode, although you’ll need a Premium subscription if you want to pick specific tracks. Spotify is a beautiful experience on Android, coupled with some excellent discovery features for finding new artists, albums and singles to check out. Playlists can be saved for offline playback and an inbox feature makes it easy to suggest your new favorite tune to a friend. Couple that with radio stations – infinite playlists based on an artist, release or genre – and a powerful search engine, Spotify continues to evolve its offering. 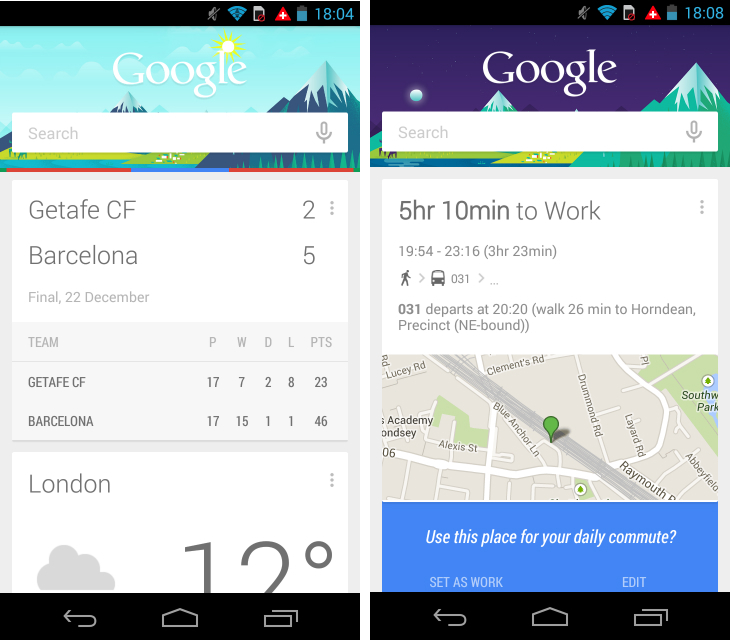 Another Google-produced app, and one that might have come preinstalled on your new smartphone or tablet. If not, it’s just another trip to the Google Play store – the app is free to download and one of the best mobile music services available for the platform. For starters, the app gives you access to all of the music that you’ve purchased digitally from the Google Play store, in addition to any files that you’ve copied manually from a computer. However, using the Music Manager desktop client, it’s also possible to add up to 20,000 additional songs using the service. 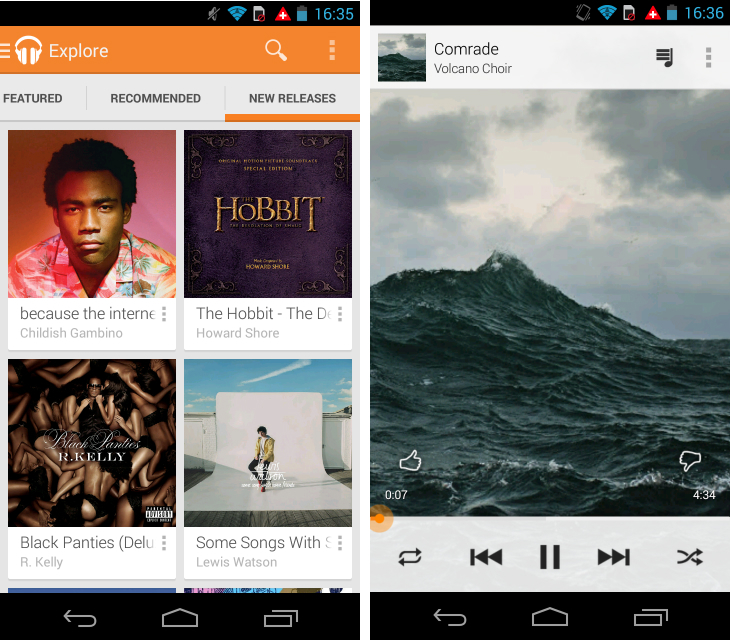 Layered on top of this is Google’s subscription-based service, Google Play Music All Access (our guide). 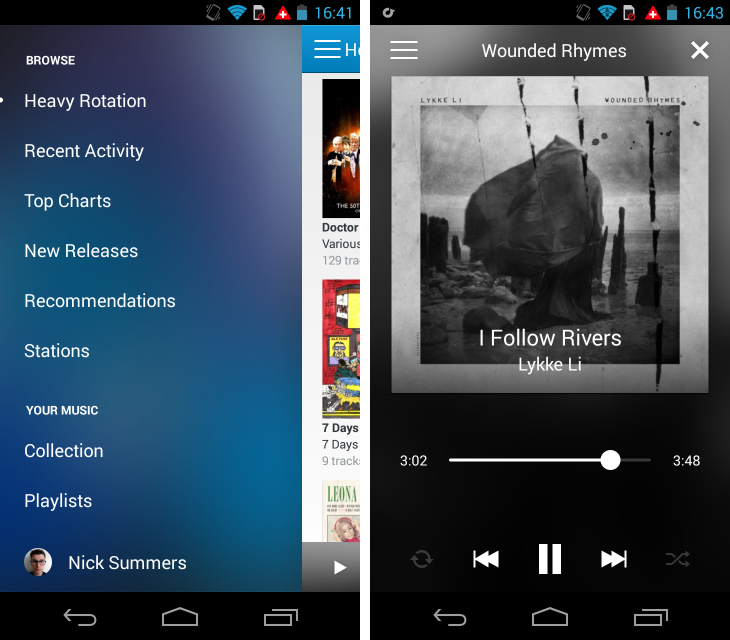 The Android app excels by offering a wide variety of ways to discover new music; no matter where you are in the app, there’s always the option to start a new radio station centered on that particular item. Combined with on-demand streaming, excellent playlist options and recommended artists/releases, this app is simply terrific. Rdio is the final all-you-can-eat music streaming service to consider, earning a spot on our list based on its incredible UI alone. The company offers a free trial for newcomers, but you’ll need to sign up for an Unlimited subscription, which costs $9.99 per month, to access the app thereafter. Don’t be put off though, because Rdio is a real treat. The in-app player is beautiful, altering the soft-focus background based on the current album artwork. Heavy Rotation highlights popular records based on your listening habits, and the Recommendations tab always gives you something fresh and interesting to listen to. 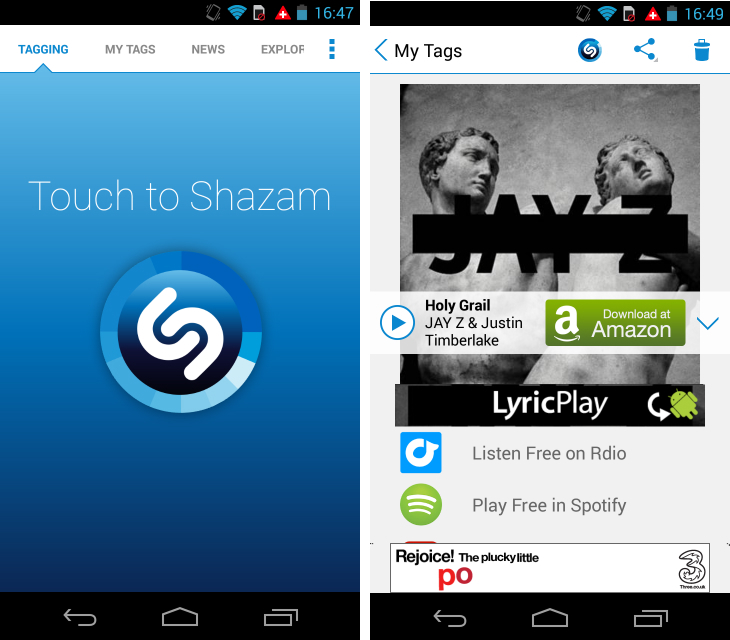 Shazam is technically a music app, but truthfully it’s more of a utility. 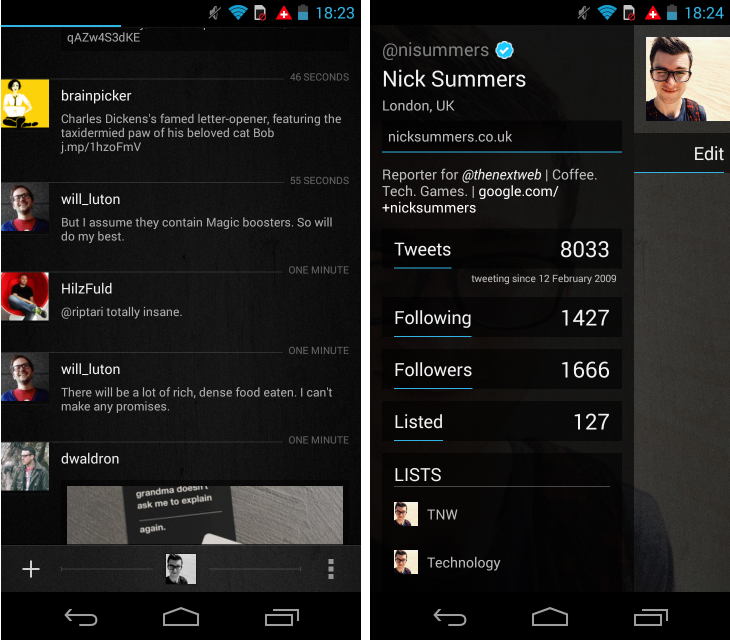 Regardless, this Android app is a fantastic tool to have up your sleeve. It serves a very specific purpose; whenever you hear an interesting track, you just boot up the app and press the large button in the middle of the screen. Shazam then processes the audio and tells you the name of the song. So it doesn’t matter whether you’re sat in the bar, walking around your favorite store, watching TV or tuning into a radio station. With this app, never again will you be left wondering who released that incredible new single. I like to think of SoundCloud as YouTube’s audio-only equivalent. It’s a community driven service, where anyone can upload and share their original sounds. 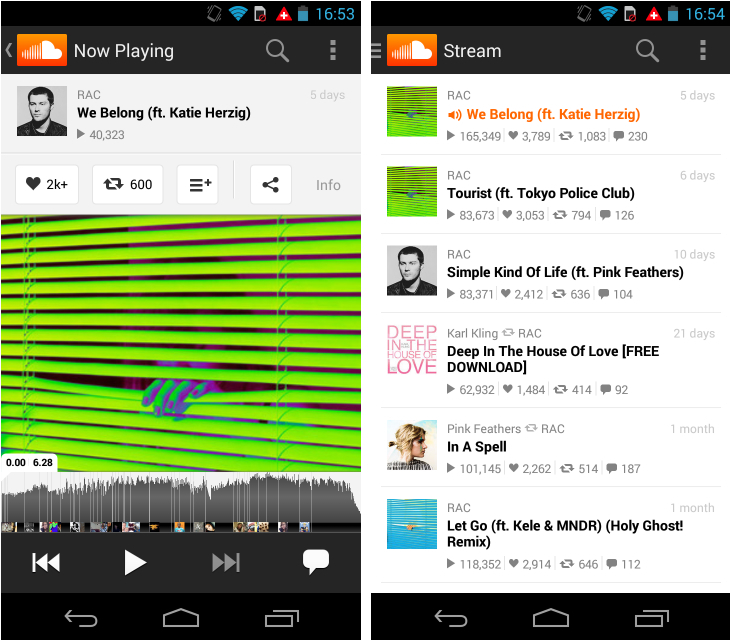 Whether you’re interested in podcasts, interviews or independent music, SoundCloud offers it all for free. The Android app offers a stream of your favorite users, as well as a functional Explore area for finding new audio filtered by genre or what’s popular on the service. The app offers a well-rounded user experience, with the added bonus of being able to submit comments at specific points of the track. Music is all well and good, but if you’ve got a terrific display on your new Android smartphone or tablet, you’ll want to take advantage of that too. Video is one of the most innovative spaces in the mobile app scene at the moment, with all sorts of startups looking to experiment with the popular visual medium. Only a handful have struck out from the rest of the pack though, and we’ve listed some of the best right here. 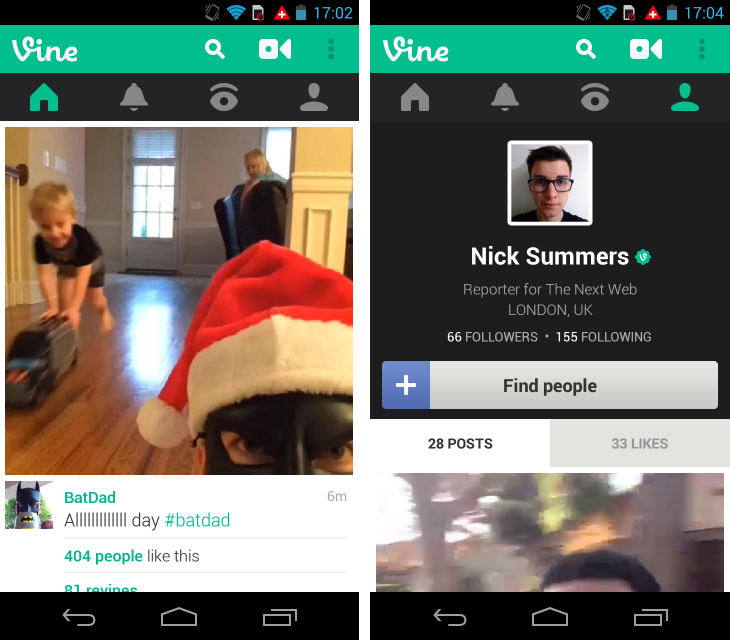 Vine, owned by Twitter, is a social network that facilitates user-generated, six-second looping videos. The app’s simple concept is twinned with an even simpler UI for capturing and editing footage; just long-press to record, before releasing your finger to signal an edit and start a new shot. There are some advanced options for saving drafts, rearranging clips and keeping a faint outline (known as ‘ghost mode’) of the previous shot, but it’s an accessible, streamlined user experience at its core. Unlike videos on Instagram, Vine focuses on its community. Instead of only following the people that you already know, Vine offers a terrific ‘explore’ area that lets you find videos centered on a genre (comedy, experimental, music, etc.) or what’s currently rising in popularity. So whether you’re making your own six-second masterpiece, or just watching those created by others, this is a sublime app to get lost in. An obvious choice, but one that can’t be understated. YouTube is massive. Vloggers, artists and brands alike have flocked to the service, and that in turn has attracted a tsunami of users. Over 6 billion hours of video are now watched each month on YouTube and over 100 hours of content are uploaded to the service every minute. Needless to say, there’s a lot to watch here. 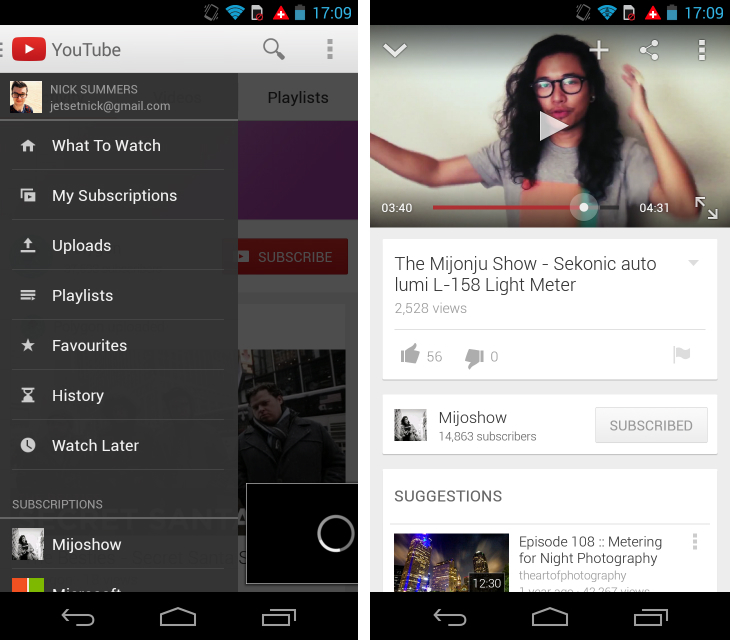 YouTube should come preinstalled on most Android devices, but if you find that the app is a notable absentee post-setup, this is well worth grabbing from the Google Play store. ‘What to Watch’ is for when you’re craving a little inspiration, while ‘My Subscriptions’ shows the most recent uploads from everyone that you follow. The UI in the Android app is fantastic; the picture-in-picture mode in particular is an absolute treat, giving you the ability to browse for your next video while the current one plays in the background. Vimeo is often pictured in the shadow of YouTube, but in reality the two sites have divergent goals and host different content. Vimeo prides itself on being the home for creatives that work in the visual medium – accounts are often used to host creative projects and portfolio items. For the everyday Android user though, Vimeo is a wonderful service for discovering inspirational, creative and experimental videos by independent filmmakers. 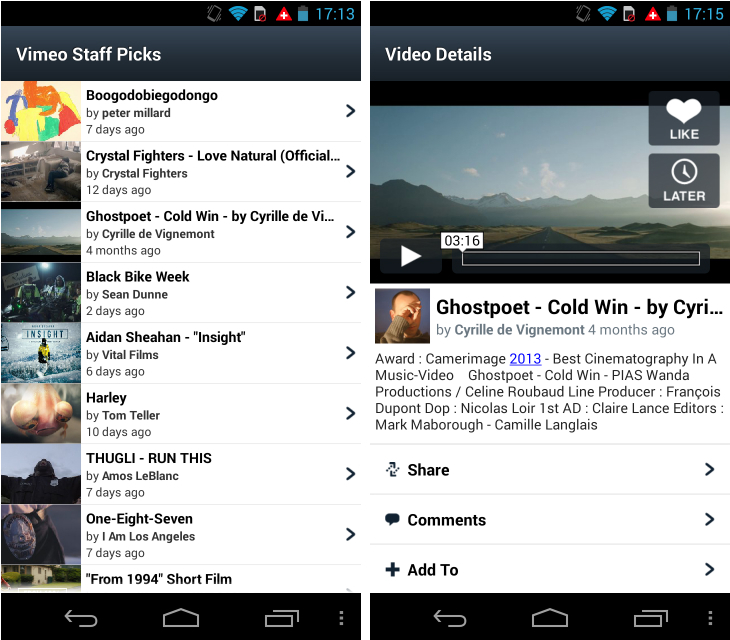 In the Android app, a quick dive into the ‘Featured’ tab reveals a treasure trove of clips to unwind with. If you’re unsure where to begin, we recommend the ‘Vimeo Staff Picks’ section, which is always packed full of high-quality, interesting videos. Also, Vimeo doesn’t have any pre-roll ads. Not one. I don’t know about you, but I think that’s pretty awesome. Hulu is only available in the United States, its overseas territories and Japan, so if you live somewhere else (like I do) you’ll need to move right along. If you are a US or Japanese citizen though, you’ll no doubt be aware of Hulu and its cross-platform content offerings. 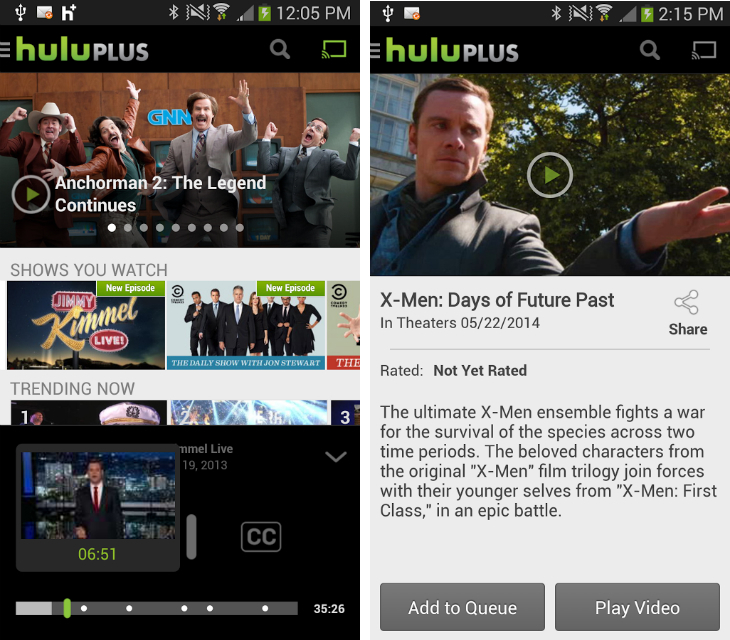 The company has 5 million customers for its Hulu Plus service, with access to over 2,900 TV shows. The Android app is another gateway to this service, giving you the option to watch Hulu’s vast array of content whenever and (almost) wherever you are. The company also plans to launch 20 original series next year, which could make it even tougher to avoid its growing video library. Amazon Instant Video could have easily filled this spot, but for our money Netflix is the best cross-platform, on-demand movie and TV streaming service on the market right now. The Android app is stellar too, with easy access to bookmarked content – termed My List – videos that match up with your personal tastes and those that have been watched by your friends on Facebook. 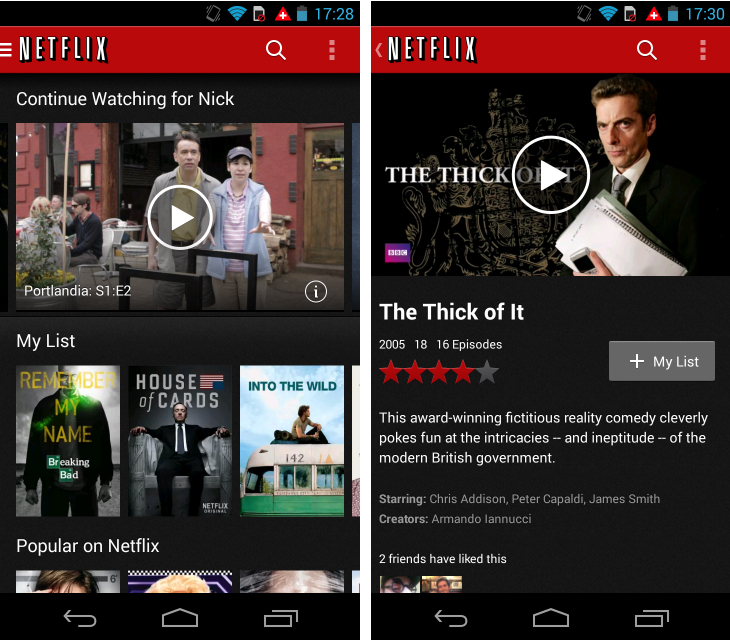 Netflix is a must-have app for its original content though. The opening seasons for House of Cards and Orange is the New Black were fantastic and Netflix, rather wisely, has already commissioned both for a second outing. If you’re still itching for new content, there’s also Lilyhammer, Hemlock Grove and season four of Arrested Development to dig into. Smartphones and tablets haven’t made the laptop or traditional desktop PC redundant just yet, but increasingly we’re turning to our small, touch-sensitive mobile devices to get work done. They’re increasingly powerful, sophisticated devices, with a growing number of apps on the Google Play store to manage email, appointments, note-taking and more. If you’re looking to be productive on your new Android powerhouse, these are the apps you should be downloading first. From day one, you’ll want a rock-steady app for your new smartphone or tablet to help deal with all of your incoming emails. 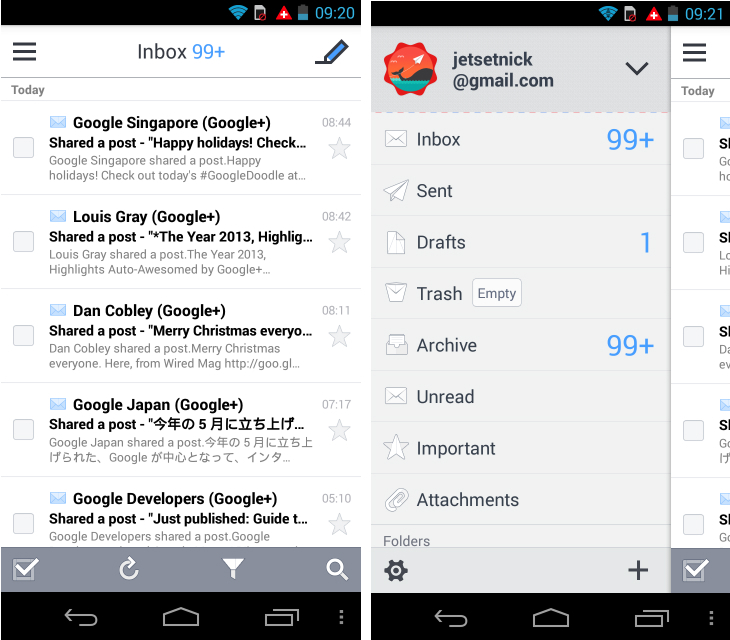 There are a few worth looking at – Aqua Mail, MailDroid and K-9 Mail all have their fans – but SolMail is my personal favorite. Similar to Evomail, this app lets you add multiple email accounts from Gmail, Yahoo, Outlook, AOL, among others and manage them using a single, unified inbox. Each account is color-coded and you can swipe messages to archive or delete them, similar to the much-loved Mailbox app on iOS. The interface is sparse but also clean in its design, leaning on a predominantly white color scheme to ensure a stress-free reading experience. Evernote can be a little daunting, but if you spend some time with it you’ll quickly uncover a deep, versatile and well-designed note-taking experience. The list of features is staggering; multi-shot camera lets you take multiple photos, before saving them together as a single note; Page Camera lets you turn physical documents into physical files, including the Evernote Smart Notebook; audio recordings are a tap away, using your new smartphone or tablet’s built-in microphone. Notes can then be sorted and viewed individually, with tags, or using Notebooks, which are essentially curated folders or groups of notes bundled together. 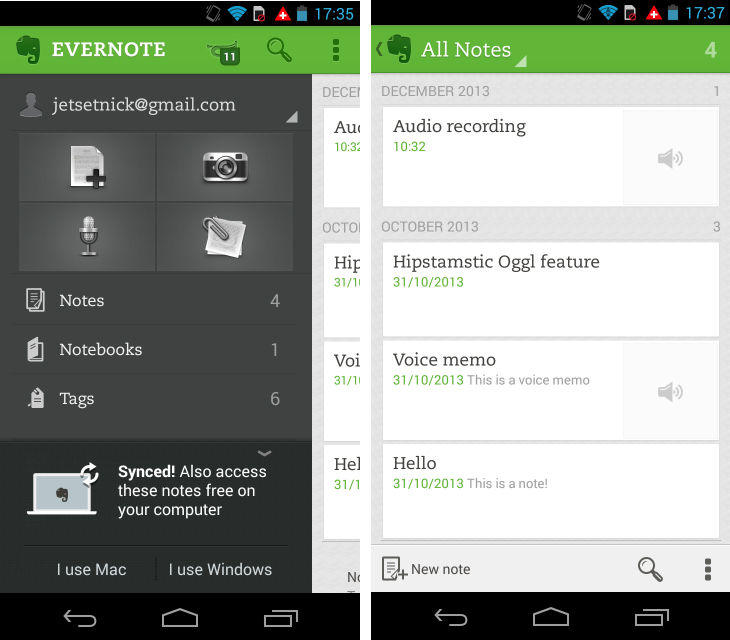 With slick editing and sharing options, Evernote is a dream for anyone who wants to manage their life digitally. I’m always making to-do lists. It helps me keep track of all the little jobs, chores and projects that I need to catch up with, and I always get an enormous sense of satisfaction when I strike one off the list. 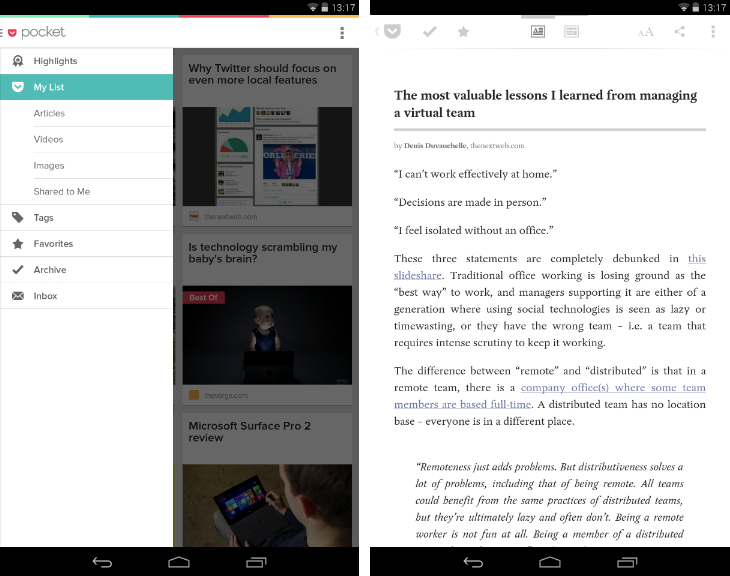 Any.do is my favorite Android app for writing digital to-do lists. The text field at the top of the screen is a quick, sensible and intuitive means of adding new items and sharing jobs with other people. Jobs can be added to a series of flexible lists (tomorrow, upcoming, someday, etc.) or you can specify an exact deadline for more important tasks. Any.do lets you add additional notes for any item on your to-do list, and when a deadline is fast approaching there’s an easy three-icon system to dismiss it, ask for more time, or say that it’s been completed. I’m also a huge supporter of the ‘Plan’ feature which shows you what’s on your agenda for the next 24 hours. 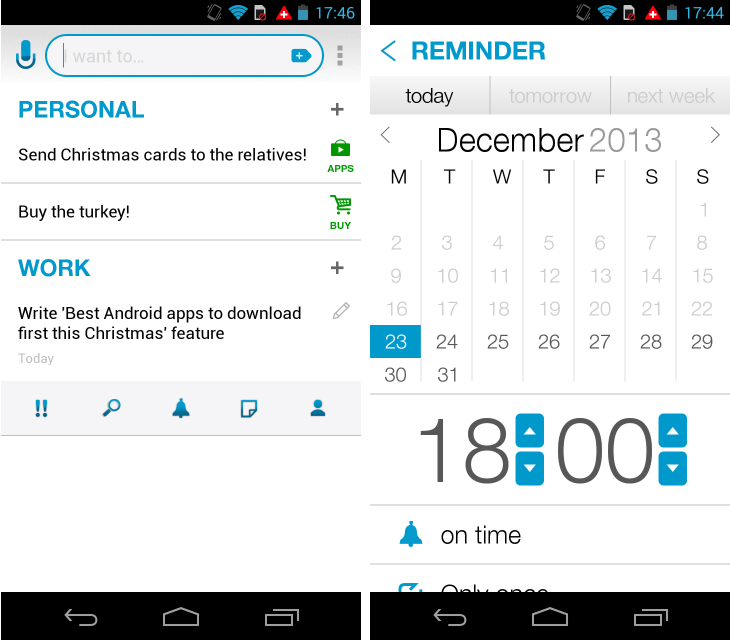 Cal is another app by the Any.do team, although this time it’s tackling your diary. 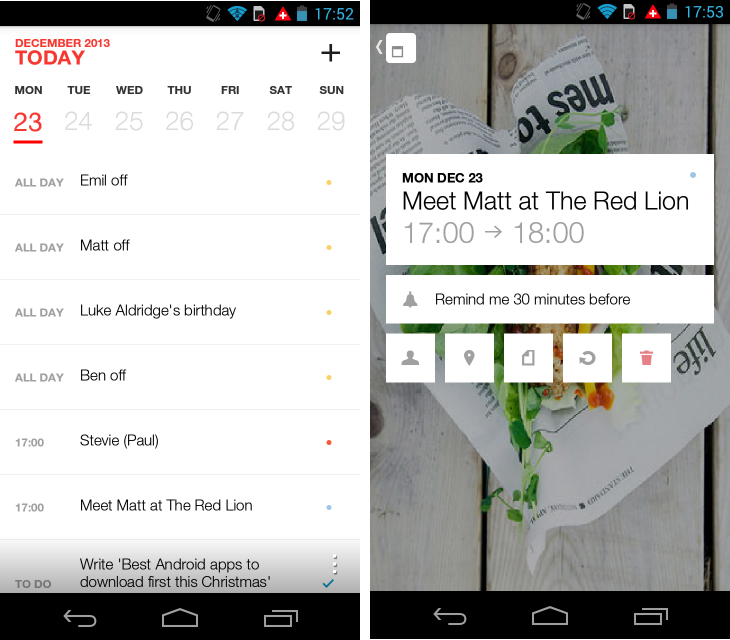 Google Calendar is a competent tool for any Android smartphone or tablet, but for a premium experience and feature set Cal is a tough app to beat. The design is stunning, with clean, legible typefaces and some good use of screen real estate. Using the ticker at the top of your feed, it’s easy to swipe to a different day and see what you currently have penciled in. Dragging your finger down reveals a monthly viewing mode and when you’re ready, while all of your individual calendar entries reside underneath in a vertical list. When you dive into a specific item, Cal gives you the ability to set additional information, such as who will be attending and where it will be held. When the appointment arises, you can use the app to review these details, grab directions or call the person that you’ll be meeting with. Google Now is the future. The app gives you useful information exactly when you need it, based on your location and how you use its connected services. This virtual assistant can tell you how far you’ve walked or cycled this month, how long it’ll take to get to your next appointment, the weather, the latest information about your flight, restaurant reservations and more. It won’t replace your calendar or to-do list app, but it’s an intelligent piece of software that will supplement and improve your life in unexpected ways. For instance, I recently started supporting the Chicago Bears (I’m a Brit and just wanted a team to follow) and without any impetus, the app started showing me their results as score cards. Smartphones and tablets keep up us all connected and increasingly, that means reading, refreshing and posting on our favorite social networks. Everyone has their favorite haunts (yes, some people still use MySpace) and many use a mixture to connect with different social circles. 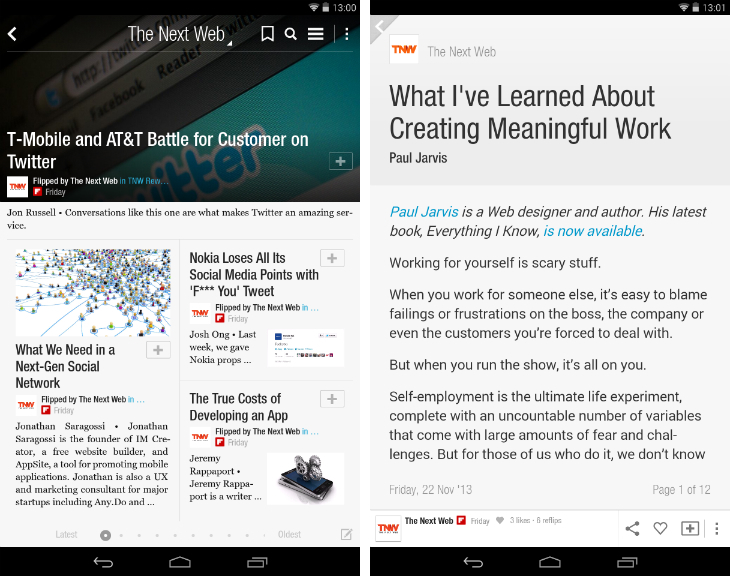 Here at TNW, these are our hand-picked favorites for Android devices. Facebook is still the elephant in the room, with 727 million daily active users and 1.19 billion monthly active users as of September 2013. The cross-platform social network is still a popular tool for keeping up with close friends and family, posting memorable photos and either sharing or commenting upon silly links from across the Web. 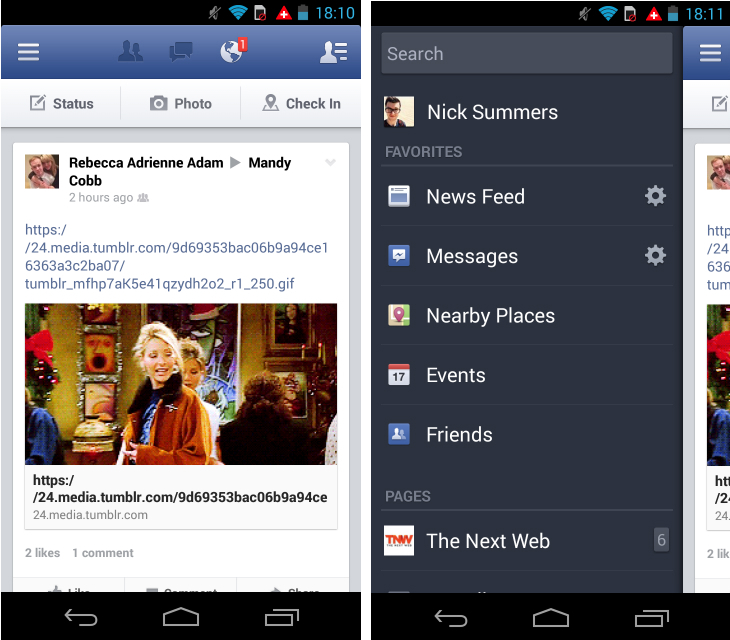 The official Facebook app for Android is slick and responsive, with a full-width feed that prioritizes posts and large images, videos and link previews. Some of the app’s quirks can be irritating – my News Feed always defaults back to Top Stories, rather than Most Recent – but overall it’s a nice user experience. Notifications, friend requests, private messages, events and pages; this app handles it all and gives you quick access to all of your most important or frequently used features using the navigation menu that slides in on the left-hand side of the screen. If the official Twitter app fills you with white hot rage (as it does for me) than it’s worth checking out Carbon, one of the best independent Twitter clients. The app keeps it simple with three feeds – the standard stream, your mentions and direct messages – which are accessed with a quick sideways swipe. The dark, metallic color scheme is a refreshing change from Twitter’s official branding and the trio of icons at the bottom of the screen let you compose a new tweet or view/edit your profile with ease. I’m a big fan of the Menu button in the bottom right-hand corner too, which displays a thin, sleek sidebar for lists, favorites, trending topics and search. Everything about Carbon is functional and considered, making it an excellent choice for both new and existing Twitter addicts. App.net is still a fledgling social platform, but if you’re a fan of its ad-free approach, Robin is a visually sharp app to have installed on your new Android smartphone or tablet. Posts are displayed in an eye-catching timeline, with thin photos displayed underneath to showcase the user’s photo, link or attached link. 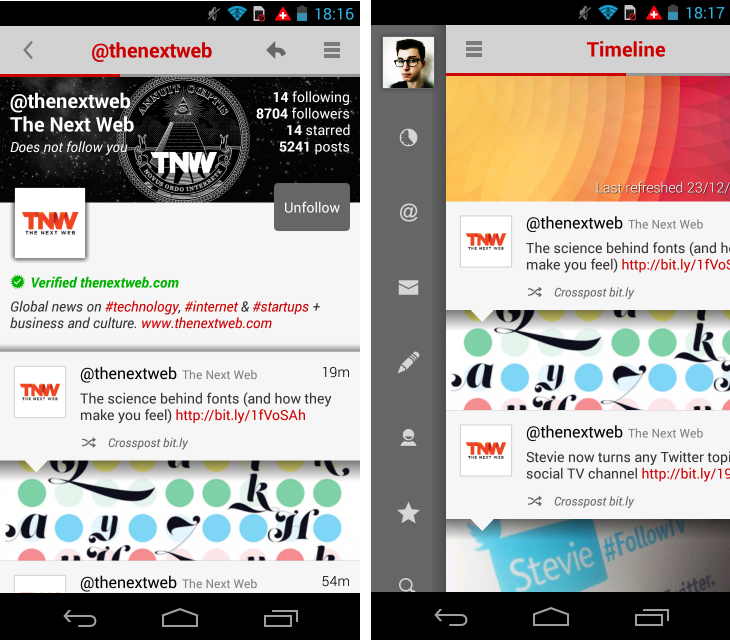 A sidebar on the left gives you access to mentions, private messages, drafts, your profile page and so forth. The design isn’t particularly innovative, but Robin is well-designed and offers a level of polish and execution that rivals some of the very best third-party Twitter clients. Google+ has its naysayers – the recent debacle with the new YouTube commenting system didn’t help – but at its core this is a social platform with a unique identity and feature set. Circles are still a novel way of filtering contacts into isolated groups, but it’s the extensive photo storage and editing features that make Google+ really shine. The app can be set up so that all of the photos you shoot on an Android smartphone or tablet are stored there automatically. These can be accessed on any device and, if you give Google permission, the platform will edit those photos automatically. 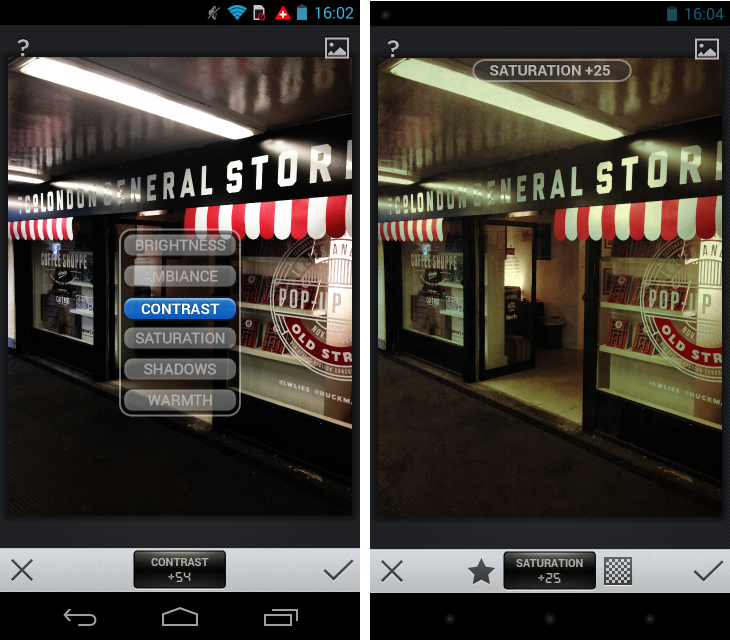 Auto-Enhance does the basics (contrast, brightness, exposure, etc.) while Auto-Awesome creates entirely new composite shots, including panoramas and HDR images. 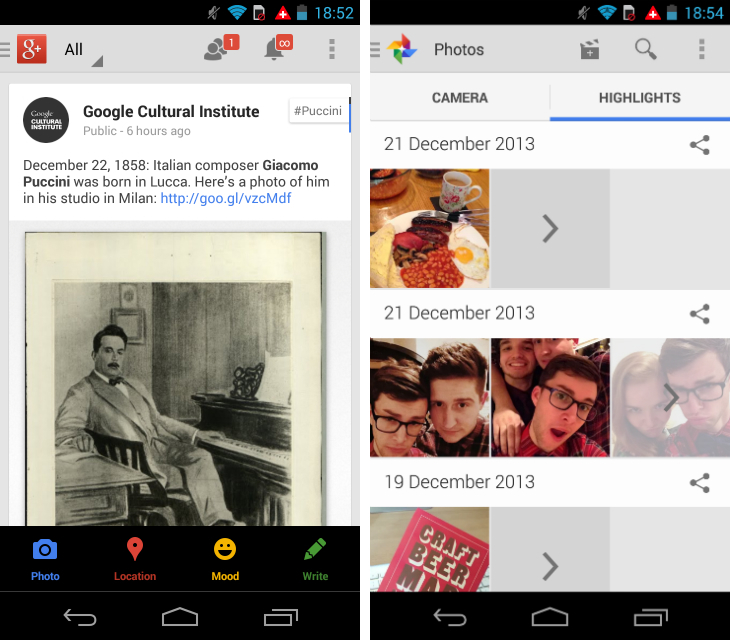 The Google+ user base is slowly evolving too and the Android app is a perfect jumping in point. With an ever-increasing number of new Communities and posts to unearth, the social network facilitates slower, but often more valuable discussions than its peers. A work in progress, but one well worth exploring. Path is for keeping in touch with the people that you hold most dear. Unlike Facebook, Twitter or Google+, the app encourages you to keep a smaller group of friends, but share smaller, often inconsequential moments, such as when you woke up or the movie that you’re about to kick back with on a Sunday night. The Android app is brilliant across the board. The icons are charming, the timeline design is simple to grasp and the clock face that darts down the screen as you scroll back in time is, in my opinion, a stroke of genius. 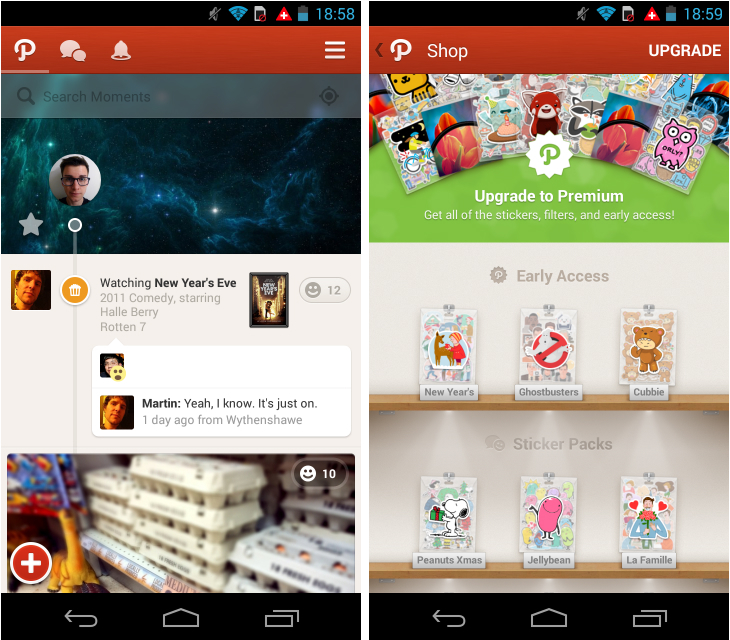 Path also supports private messaging, which is a nice bonus, but the meat of the experience is when you’re posting or reacting to status updates. Even with a stock Android device, there are some irks and quirks to Google’s mobile operating system. None of them are catastrophic, but thankfully the open platform makes it easy to customize and personalize the experience with third-party apps. None of these are essential per-se, but they’ll certainly improve the experience somewhat on your new smartphone or tablet. 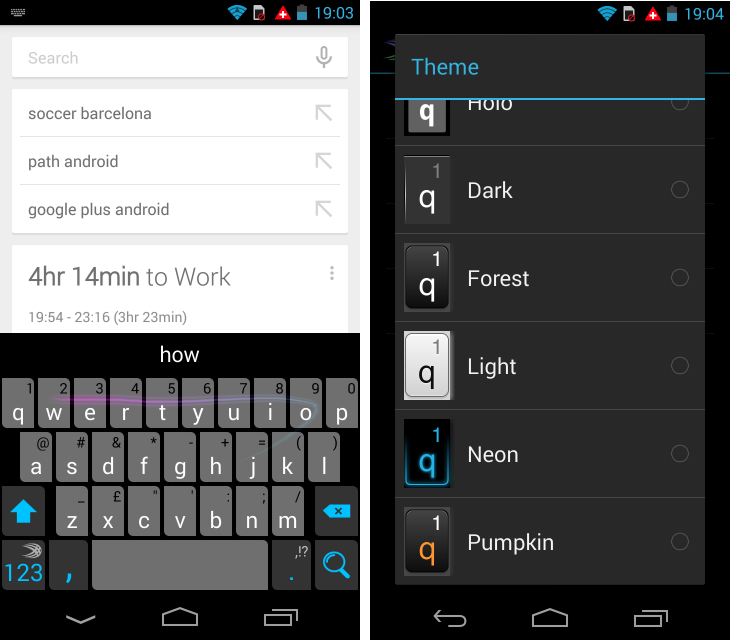 SwiftKey is all about customization. Want a different look? You can skin the app in a number of different colors and styles. Want better word suggestions? The app can learn from your writing style on Gmail, Twitter, Facebook and other services. The third-party keyboard also includes a feature called ‘Flow’, which means you can trace all of the letters in your next word or phrase without releasing your finger. Better yet, Swiftkey will use its predictive engine to begin guessing your word from the moment you touch the screen, increasing the speed and accuracy of your typing. 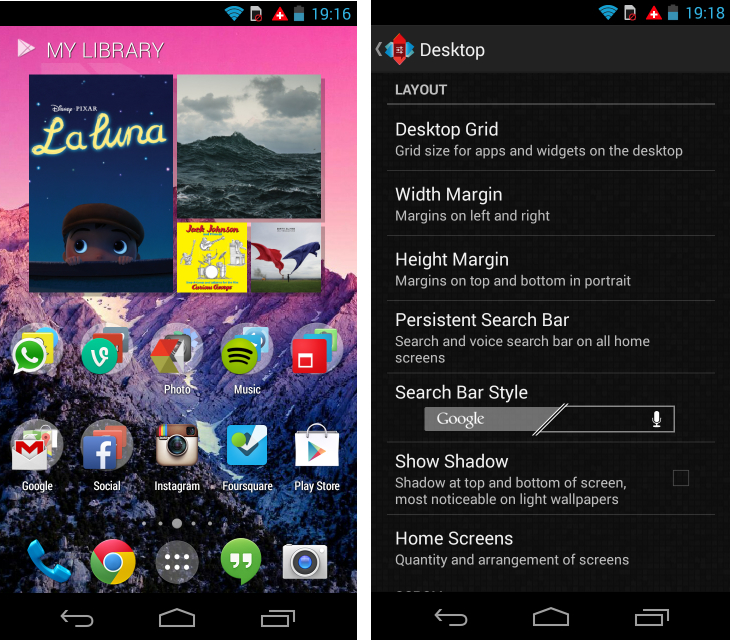 Nova Launcher gives you the utmost control over the look and behavior of your new Android device. It lets you change how many app icons are shown on your home screen, the margins on either side and the transition effect between home screens. Bundle that with advanced customization options for the app and widget drawer, the app dock and any app folders on your home screen(s), and it’s to see why Nova Launcher is such a popular choice. 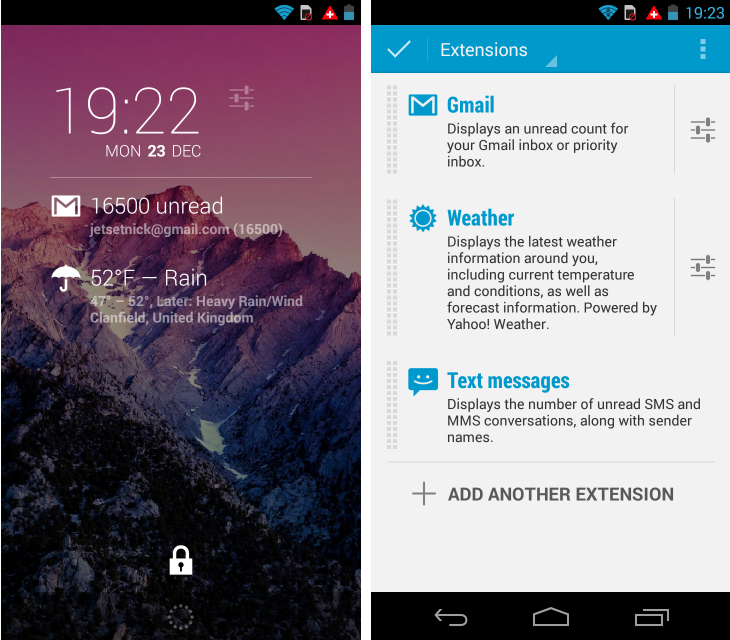 Once you’ve unlocked your smartphone or tablet, Android handles notifications incredibly well. From the pull-down at the top of the screen, you can easily review your most recent alerts and take action on many of them without even opening the app. The default lock screen, however, can often feel a little lifeless and unhelpful, which is where DashClock Widget comes into play. As the name suggests, this widget adds a slick digital clock to your lock screen, but more importantly it also supports notifications from other apps installed on your device. These could be for text messages, calendar appointments, the weather, new emails – you get to decide what’s shown or hidden on the lock screen. So every time you hit the power button, you can now review your notifications without entering your security pin or pattern. Bliss. 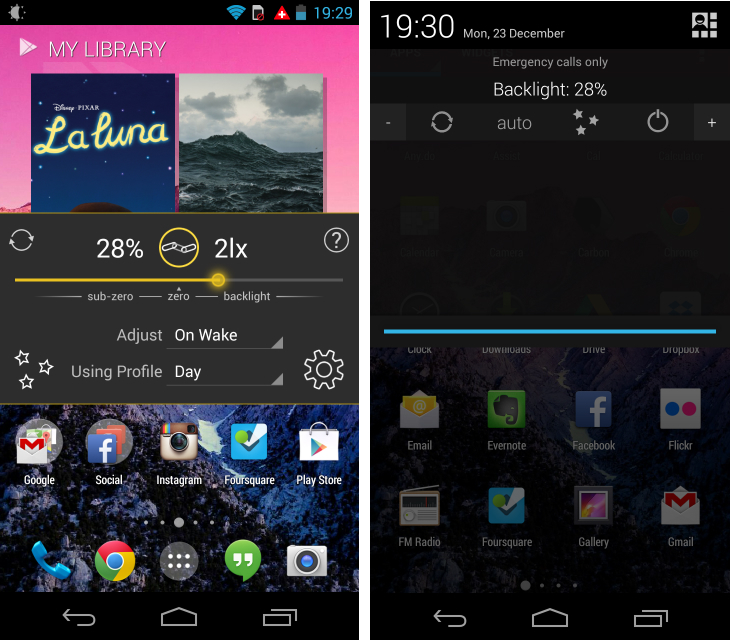 Screen brightness is a common problem with Android devices. A low-end smartphone or tablet is often quite dim or murky, while the auto-brightness setting goes haywire whenever you step outside or enter a dimly-lit room. If you encounter this problem, it’s worth checking out third-party Android app Lux. This little tool sits in your notification drawer and tells you how the brightness percentage at all times. You can change it manually using the plus and minus icons on either side, set a brightness profile and when you would like the app to adjust your screen automatically. This could be when you first wake up the device, when a change in ambient light is detected, or at set intervals throughout the day. It’s smart and most importantly – it just works. Now more than ever, it’s important to keep all of your most important files backed-up and readily available. Google Drive is a good alternative, but here at TNW our go-to cloud-based storage provider is Dropbox. 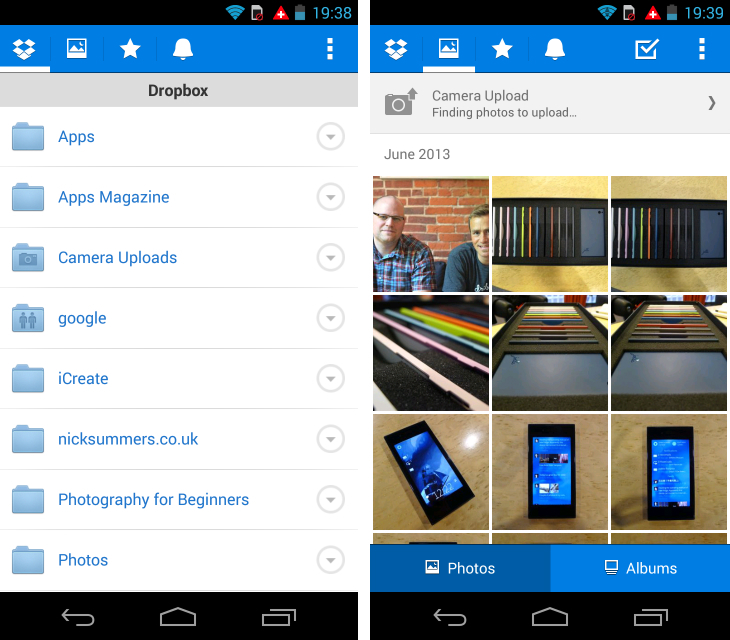 The app can be set up to store all your photos automatically (if you’re not feeling Google+ yet) and the app has a clear, uniform design for looking through folders and downloading files. When you haven’t got your laptop or a thumbnail drive to hand, Dropbox will bail you out time and time again.